The debate over whether a classic French 75 is made with gin or cognac continues to rage, but there is no question that it is one of the most elegant Champagne cocktails. If World War I pilots and Ernest Hemingway were partial to it, you can probably consider it an adequately manly drink, despite the bubbly content. Here’s the Leacock take on this classic. Place glass in freezer to chill. Pour the cognac, lemon juice and syrup into a shaker half-filled with ice and shake vigourously for 45 seconds. Strain into the chilled glass, top up with Champagne and garnish with a lemon twist. For bourbon lovers: A French 95 is a variant of the French 75 made with bourbon and orange juice. The bourbon is obviously an excellent idea, and it works very well substituted directly into the recipe above (no oranges necessary). 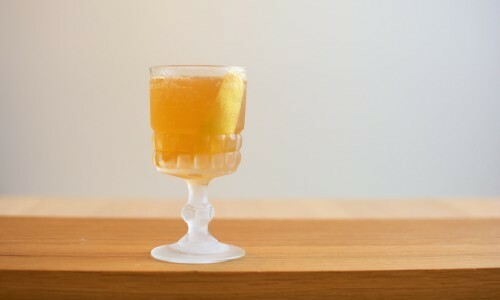 Since the bourbon and lemon are reminiscent of the Man o’ War, and since the original French 75 is named for a piece of field artillery, we’re going to go ahead and call this a French o’ War. This entry was posted in drinks, recipe. Bookmark the permalink.